Facebook is a great way to find out how fellow dog-lovers in all corners of the nation tap into the pawsitive powers of man’s best friend in so many ways. When I saw a post about Anat Hayon Cunha’s personal journey, I wanted to share it with all those who love to read about the healing powers of our canines. As we give thanks this Thursday, remember to be thankful for all the ways our pets give us their unconditional love every day. Each day in the United States, countless numbers of dogs are destroyed in shelters. This is such a silent tragedy, a sad waste of life, and a loss of an undervalued natural resource for teaching and healing. Here, Anat tells about her very special dog named Mika, testament to the potential of the paw…. Welcome Anat! Please tell us about events in your life, and how you “went to the dogs.”I was born in Jerusalem, Israel and immigrated to the United States with my parents at age five. As a child I had dreams of becoming a veterinarian but quickly realized that I was way too sensitive to deal with animals that were hurting, so I did the next best thing and became a Paramedic with Life Flight New England and a Respiratory Therapist for 20-plus years. I have always been a caregiver and can’t recall not having a pet or two throughout my entire life. I was the kid that brought home hurt squirrels, birds and anything else I could rescue. My mother is the biggest animal lover I have ever known and definitely fostered this caring spirit in me. Ultimately, however, I found dealing with human patients far more palatable than animal patients. Most people don’t quite understand when I tell them this but I guess the fact that animals can’t speak for themselves and must rely on their human counterpart 1000% for their care and well-being was just more than I could handle. 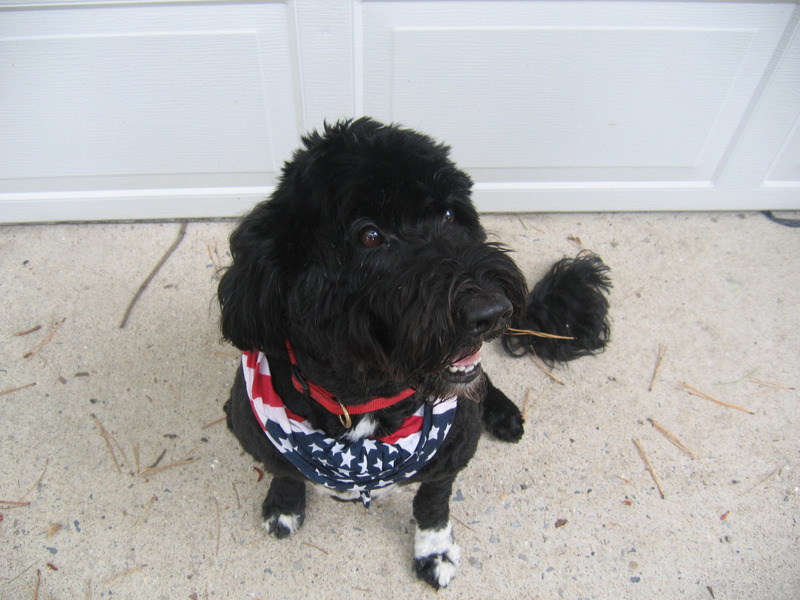 Please talk about the Portuguese water dogs in your life. We got our first PWD in 1990 due in part that my husband, Michael and our three children, Max, Madison and Mason, are highly allergic to animals and the fact that my husband is Portuguese made it a perfect fit! From there, a life time love affair with the breed quickly developed. My next Portie came at a very difficult time in my life. I had been diagnosed with a rare autoimmune disease for which there is no cure. It quickly robbed me from being a first class athlete, mother of three, wife and the career I loved. It crippled me for over five years. Now, being on the other side of medical treatment, I REALLY understand why it’s called PRACTICING medicine! I underwent many treatments and surgeries to wrangle the disease and in doing so I was forced to spend a lot of time alone. Of course I have a wonderful husband and kids and even extended family and friends, but when you are severely chronically ill it takes its toll on everyone. My kids still had to go to school and my husband had to work more than ever. 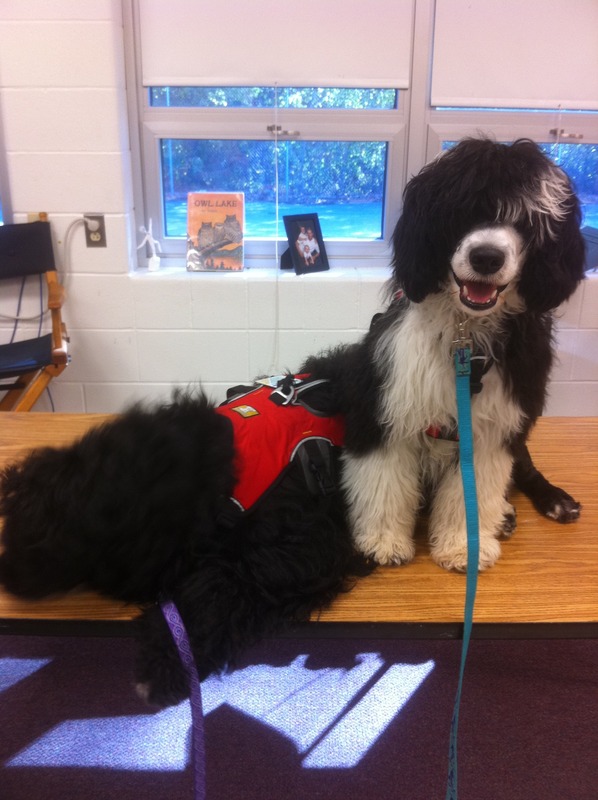 When I found this precious Portuguese water dog puppy for my husband I thought this would be great for him and the kids, but what happened next was truly just miraculous. This puppy would stay at my bedside constantly, not wanting anything but to be with me. Slowly, she started to “rehabilitate” me if you will. I was in constant pain and very fatigued from the treatments but she really forced me to keep moving and Pico became my best friend. Tragically at only six-months old, Pico was fatally struck by car in front of my house which my entire family (except for me) witnessed, as I was too sick to be out. It was a horrible accident that rocked me to the core. My husband and children were so moved by the extraordinary relationship I had with Pico and how much she was doing for me both physically and mentally that they set out to find another PWD that would ultimately become my Service Dog. That dog is Mika! Truthfully I didn’t want another dog ever again; at the time the loss was so devastating to me and I didn’t think another dog would ever be able to do what Pico did….. I was wrong. Mika, which my youngest son Mason named, means gift from God in Hebrew and that she truly is! Mika slowly found her way directly into my heart and much to my surprise did exactly what Pico had done. I now believe that this breed is extremely keen in sensing, or perhaps even smelling illness and they have a hugely sensitive and loving spirit. My husband helped me train and reach the appropriate bench marks needed to put a Service Dog Title on her and in doing so I began to remit. I have been in remission now for over two years and I believe in my heart and soul that it is because of Mika. In the process of training Mika, I decided to go ahead and get a Therapy Dog Title through Delta Pet Partners, because I already knew she was way too special to keep all to myself, and if I could help another person through Mika, that was a way I could give back. We started out by going to nursing homes and assisted living facilities, but my real desire was to work with children. How did Mika become a “teacher” in your local school system?When I was training Mika for service I had to take her everywhere with me; doctor visits, shopping, restaurants even hospital stays and the reaction from the public at large was always a big smile and “oh can I pat your dog?” But no reaction was more magical than that of the children. With their eyes so large and smiles so big, it just helped to heal me in a way I had never intended or expected. When I began to have more good days than bad, I contacted my local school volunteer director and we hatched a plan to have Mika visit all of the community’s lower schools. Sometimes we would visit special needs classes where the students took turns reading to Mika and sometimes we would work one on one with an autistic child where Mika would just lay quietly while the child brushed her long, soft beautiful hair. 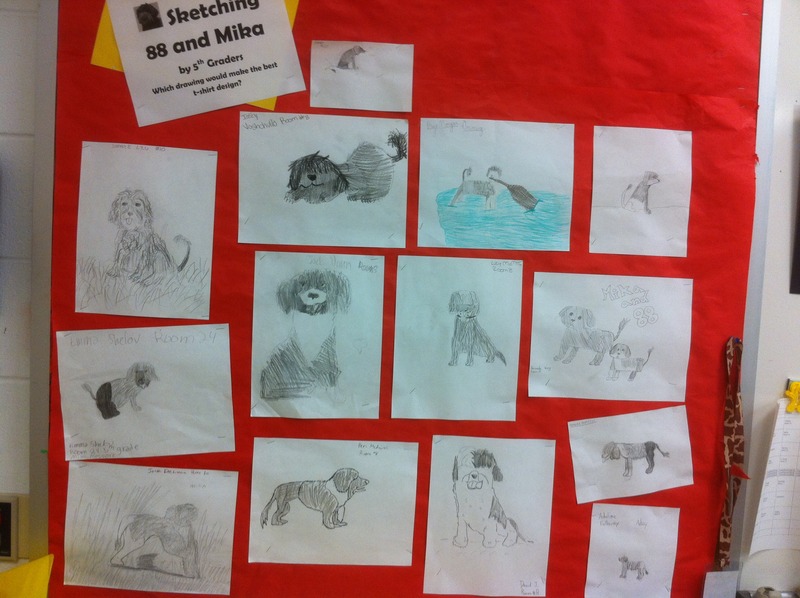 Most recently we were invited by the Fifth Grade Art Director to come in and pose for an art project. Together we collaborated and hatched a contest for the best rendition of a PWD. The winner will have their rendition put on a Tee-shirt which we will sell and share the proceeds between the school art department, Humane Society and the Portuguese Water Dog Foundation. How do the students react to a dog in the class room?Whenever I go to a new class, I start by talking to them about this breed; what they were bred for, why Mika has a funny Lion’s cut and since she speaks on command they get a real kick when they think she is talking to them. I think one of the things they all love the most is that Mika knows how to open and close doors on command. And their expressions….. well, they are priceless! It’s really hard to put into words how the children react. Most are so very excited and want to share their own dog stories, some are afraid, and with them I really take the time to help them feel safe to explore a dog that I trust with my life. One of the most important things I do is teach children about dogs in general. I explain that not all dogs are friendly like Mika and to never approach a strange dog and to ask a handler if they may pet a dog and then how to do that properly. I also take the time to explain about how special Service Dogs are. Was your schools system open about the idea of having Mika in the classroom?Living in Rhode Island where there is a strong Portuguese community, and having a sitting President with a Portie, definitely opened the door for me to approach the school, however Mika sealed the deal when they met her. Now she is somewhat of a regular and a bit of a celebrity in the schools and the community. I see kids all the time whether it’s at the market or the pharmacy and they very nonchalantly walk by and say “Hi Meek” and keep walking because she has her red vest on which means she’s working and it’s not social time. I feel like I’m really doing my part in educating our future pet owners. I wish every school, Nursing Home, and any organization where there are people of all ages who could benefit from the power of pet therapy would embrace having a wonderfully trained animal visit their facility! Some artwork inspired by a pair of picture-perfect Porties! Just as an added footnote: Mika (aka CH. Wayfarer CnSand Pure Karma RN, CGC, TDI) is not just a working dog she is a beauty, just recently crowned a Champion and soon to be a Grand Champion! Thank you Anat. I wish you, Mika, your family, and all who have been following a long, a very Happy Thanksgiving. 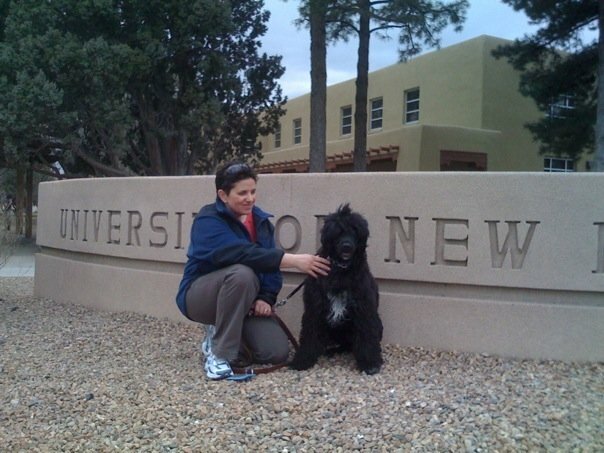 To learn more about Anat and her Portuguese water dogs please go to www.karmapwds.com. As many of you know, I’ve spent time down in Big Pine Key, FL, and while there, got to know some great volunteers who were working very hard to build an off-leash dog park on the key. Sadly, one of them, Amy Bressem, has passed before seeing this dream realized. Tomorrow, at 4:30, a Memorial Service will be held at the beautiful site of Bahia Honda Park. I am aware that many have visited my blog to keep posted about the park’s progress, and I wanted to share this news about the passing of a dedicated dog lover who died so young at the age of thirty-four. My condolences go out to her friends and family at this difficult time. Recently, my friend Bocker Labradoodle told me about an exciting event to be held on November 20th in mid-town Manhattan. Christmas Feet and Family Day at Citi Pond at Bryant Park offers something for everyone, free skating and skate rentals for the little ones, performances by Broadway actors, ice-skating performances by the Haydenettes, the stars of Rescue Ink, and a pet fashion show directed by New York City “pawty” planner extraordinaire, Ada Nieves. Christmas Feet is a children’s book written by Maureen Sullivan and illustrated by Alison Josephs, both of whom will be appearing at this event. Christmas Feet tells the story of Carlos, a French bulldog that finds the true spirit of the holiday while spending the day in Bryant Park, read more at www.anklesoup.com. Once-upon-a-time, my office at Home Box Office overlooked Bryant Park, and as I taught ice-skating to kids for years, and of course love to write about dogs and kids, this was an event I wanted to know more about. I thanked Bocker for the bark-out and contacted Ada Nieves. A native of Puerto Rico, Ada is very active in the Latino community and is breaking new ground in the world’s dog community as the official “It Girl” for pet events in New York City. Ada is a renowned Certified Pet Fashion Designer, gourmet treat baker and successful “pawty” planner. 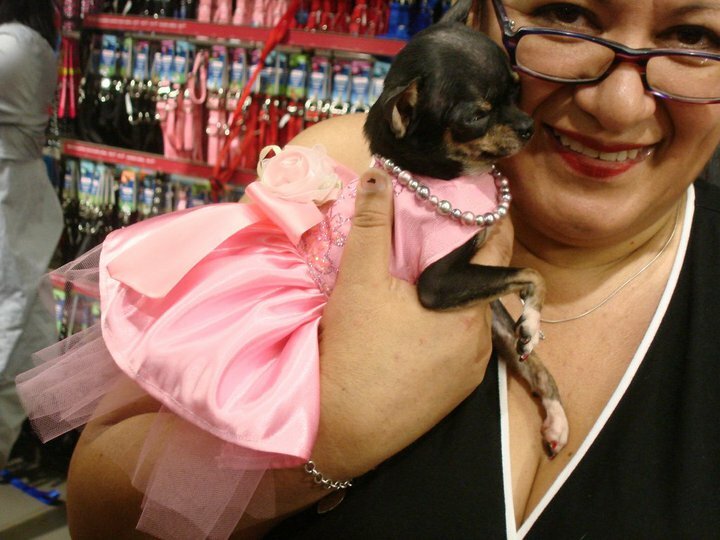 She heads the largest Chihuahua group in the nation, hosts a Pet Life Radio Talk Show, Vida Doggie, writes for the Examiner.com and is a contributor to several pet magazines. She is the Vice-President of Special Events and Communications for Inky Blue Sea (www.InkyBlueSea.org), the President of a dog walking service, and runs a FREE pet pantry that provides pet food for pet owners with disabilities. Ada explains that she “went to the dogs” as a way to boost her spirits when her husband was deployed to Iraq. A children’s party planner at the time, Ada involved herself with all things dogs, transferring her business skills to a pet party planning business making dog cakes, treats and clothing allowing her to spend more time with her “Chichis,” her family of adorable Chihuahuas, which now numbers five. And Ada’s Chichis are busy working dogs. Cinnabon Bon, Vanilla Salt, Mojito Bandit, Margarita Ville and AKC CH Tabasco Chill Pepper (the only champion living in New York City) are joined by resident cat, Martini Beethoven. Ada’s dogs have appeared in numerous television commercials. A recent session had them filming segments for Animal Planet and National Geographic, and Ada recently worked on the set of 30 Rock as a dog stylist. They have also appeared on the Martha Stewart Show, the Conan O’Brien Show and Sabado Gigante/Univision among others. To read more about Ada and her talented pooches, please go to www.adanieves.com. Ada is the Creative Director for the Fashion Show Event to be held at Christmas Feet. Hosted by Harrison Forbes, noted Pet Behaviorist and host of Pet Talk, a nationally syndicated radio show, some adorable dogs will make their way down the “cat walk” modeling creations designed by Ada. Among them, none other than Bocker Labradoodle sporting a red satin outfit with black trim and sunglasses. Bocker will be escorted by actress Amanda Henderson, star of eat, pray, love! Other lovely four-legged models include Rose Russo’s Penny Lane and Lilly Pads and Lola, Tuffy and Munchie, “owned” by Lourdes Lebron. On February 11th, at 8:00pm for the sixth year, Ada will present the Pre-Westminster Fashion Show at the Pennsylvania Hotel in Manhattan, something I’ll share more about as the day nears. I sure wish I could attend this exciting event, but my work takes me elsewhere. But since I’ve always wanted to attend a Westminster Event, I may just accept Ada’s invitation and take in that fashion show for myself in February! Perhaps Ada can help design some fun dogwear for an upcoming National Dog Week observance. Thank you for taking the time to share all your accomplishments with me, Ada. For more information about Christmas Feet please call (212) 661-6640. On a sad note, one of Ada’s beloved dogs, Tequila Bon passed yesterday, making it a very difficult day at the Nieves household. We are so sorry to hear about your loss, Ada. 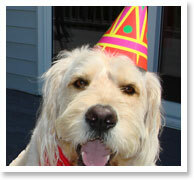 Get the Scoop on Carla Gambescia’s Flavorful (FUN)d Raiser, Dogs in Party Hats! Welcome to my Blog, inspired by Captain Will Judy, who in 1928 launched a special way to celebrate the unique enduring bond between dogs and their humans, observed the last full of week of September each year! Congratulations to Michele Adams and her dedicated team of volunteers down in Big Pine Key, FL. (see post of March 24th for details). 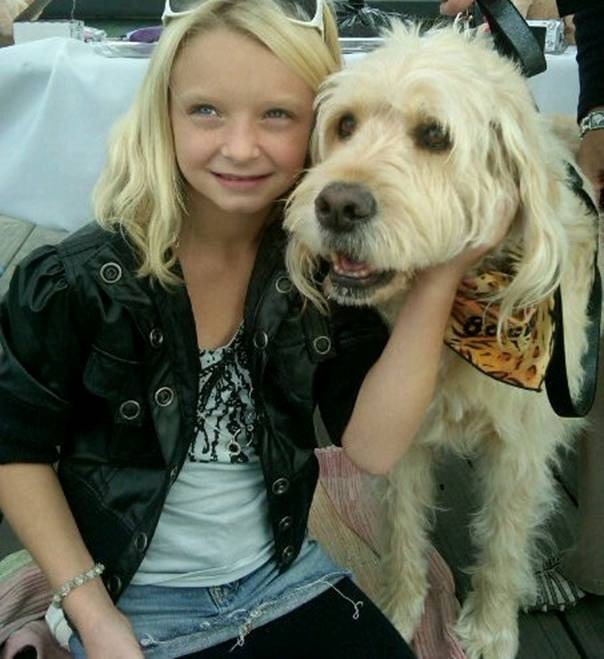 Last Saturday, they successfully raised over $500.00 at their dog wash/vaccine clinic. Proceeds go to realizing their vision for a state-of-the-art dog park by early next year. Good luck to them as they plan their final fundraiser of the year, a Christmas Party event to be held on December 12 at Parrotdise on the Beach (a great place) – all dogs and their humans are welcome for a fun-filled celebration with a “paws.” I think our dogs really put a lot of fun in our lives, and keep the spirit of generosity in our holiday season. Stay-tuned for a post about Ada Nieves and her holiday event at Bryant Park, NYC, on November 20th! As a child, Carla Gambescia preferred stuffed dogs to dolls, and soon fell in love with the real ones that would populate her life. Now through her business establishment, she gets to fuse her love of dogs with her passion for food, which has resulted in a unique, and flavorful way to raise money for a cause that helps dogs to help people – Guiding Eyes for the Blind, America’s leading Guide Dog School (which is now also breeding and training dogs for both visually impaired and autistic children). Dogs in Party Hats, is a contest that has dog owners dreaming up some delicious gelato flavors inspired by their faithful companions. Some recent concoctions are Carnivale Caramel Teddy, La Boheme Almondine, and a popular favorite from their gracious spokesdog, Bocker’s Doodlicious Swirl (a yummmy blend of banana and caramel). This year’s contest was launched on April 28th on International Guide Dog Day and runs until Midnight, December 12, 2010 (Please note this extended deadline). Entries are $20.00 each- which serves as a donation going entirely to Guiding Eyes for the Blind. To learn more about the contest, and enter your dog, go to www.dogsinpartyhats.com or visit their Facebook page. Hi Carla, thanks for sharing your work on behalf of dogs, and humans in your creative way. Please tell us a little bit about yourself…and your eating establishment, Via Vanti! Restaurant and Gelateria located in Mt. Kisco, New York. I have been a Marketing & Communication Veteran of nearly 30 years — from Madison Avenue advertising agencies to my own marketing consultancy business which I had for 20 years — I specialized in foods, beverages and food service new product development. I was also a partner in a gelato company — Ciao Bella for several years before I opened my own place. I have had poodles and various mutts/rescues. Dogs are people and totally connect with our emotions — they just make life better. Did you know that the popular dog name “Fido” comes from the Latin word fidelis for faithful and trustworthy??!!! I also have a great love for all things Italian — my parents were both Italian and we traveled to Italy frequently even when I was just a child. I have always loved gelato ( a highlight of each and every trip to Italy). In 2007 I designed a bike trip that won Outside Magazine’s Best Trip in Western Europe — the Giro del Gelato designed around gelato tasting!! Via Vanti! Restaurant & Gelateria is a dream of nearly 15 years that I have now ” brought to life.” This brings together my professional experience and personal passions (for Italy, gelato etc). The restaurant is eclectic Italian — NOT traditional Mama Mia fare. Everything is lighter, fresher, healthier … our menu integrates local and seasonal ingredients as well as fusion elements. We were well reviewed by the New York Times (Zagat rated very good to excellent for food, service and ambiance) and named “Best Gelato Shop in New York” We offer 18 flavors daily. YUM!! We have an official Mission Statement which is: “Dogs in Party Hats is dedicated to raising awareness and support for Guiding Eyes for the Blind and all their good works. Dogs in Party Hats is also dedicated to celebrating dogs and all the amazing ways they make like better”. Guiding Eyes for the Blind (http://www.facebook.com/l/b0f3dngh6hy1Zrr2rf_u-WXlHBg;www.guidingeyes.org) is a national organization headquartered in Yorktown Heights, New York very close to my restaurant. Guiding Eyes has recently initiated an addition program matching guide dogs with kids struggling with autism. They are a wonderful well managed organization that provides all services to the visually impaired and autistic for FREE. I have 3 blind cousins whose lives have been vastly enhanced by caring canines. As a foodie and I see flavors everywhere. I love dogs and have seen them as gelato flavors (their colorings and personalities) for a long time I see a Pug and I think “Butter Rumba” or a Collie and think “Pumpkin Latte” or a Chihuahua and envision Mojito Spice (as a spunky refreshing sorbetto!). Anyone can do it — all you have to do in UNLEASH YOUR IMAGINATION! Think of your dog as a yummy flavor, dress them up — ideally in their party best, snap a picture and upload to http://www.facebook.com/l/b0f3d8c9Tl3u1y78st0bUezdJ3A;www.dogsinpartyhats.com. The entry fee is a donation and there are 12 annual winners — each who will inspire me to create a 2011 Gelato Flavor-of -the Month. 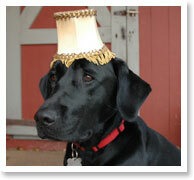 Winners also become a Flavor-of-the-Month “Pin-up Pooch” in the next year’s Dogs in Party Hats Annual Calendar. We are selling the 2011 Dogs in Party Hats Calendar online for $15 with ALL profits going to Guiding Eyes for the Blind. So there are TWO away to help support Guiding Eyes — by entering the contest or purchasing a Dogs in Party Hats calendar. The calendar is a fun affordable gift idea for dog lovers everywhere! I encourage everyone to do BOTH! Party Hats off to (I mean on to) Carla and her dogs of fundraising…In the innovative way she has used her savvy business skills and talent, she embodies the true spirit of Will Judy’s National Dog Week Movement, every week of the Calendar Year. Carla, can you come up with seven great flavors for seven days of the dog for next September’s dog week? I don’t think that will be too “ruff ” for you!